I got this for my grandaughter who is 4 years old and older beyond her years. She loves the Trolls. I received it in good condition but I still washed before I gave it to her. It washed and dried with no wrinkles. She sleeps on the bottom bunk bed and it fit the bed perfect. She was so excited to go to bedI definately would recommend this product for your little darling. Your little one will be off to bed and dreaming about their next adventure with this Trolls 'Show Me a Smile' Bed in a Bag Set. Bedding Ensemble includes a Twin/Full Reversible Comforter and sheet set. Twin/Full Comforter features Princess Poppy dancing in a bed of flowers on one side and Poppy with her friends Branch, Guy Diamond and Copper on the other side, the reversible design lets your child change the look of their room and bed as they feel. Both comforter and sheets are made of 100 percent polyester are washable for easy care and maintenance. Makes a great gift. Granddaughter received today and loves it. Material of sheets and comforter is nice and looks like it will be warm. The smiles and giggles of a little one is precious. To see them so excited about something like this and to know that it isn't an expensive but cheap made product is something to make me happy. Washed and on bed for a nights rest. Washed up nicely. I recommend..
My daughter absolutely fell in love with this bed set!! it was the best present that we could have gotten for her. I had also bought the trolls body pillow to go with it and she loves this whole set its very comfortable and easy to wash! 5 stars from us!! Super cute bedding. 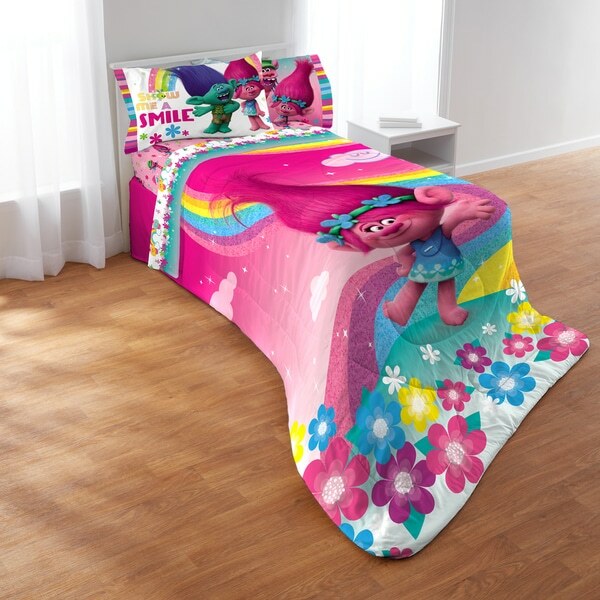 Very colorful and bright-perfect for a little girl's bedroom, especially if they love Trolls. It isn't overly thick and washes well. My 2 year old old loves this set. I put it on her twin daybed and she cant wait to take naps. Im a happy camper and so is she. The trolls is just a plus! This bedding set was just gorgeous! My daughter loved it and always asks me to wash it put it right back on. Bought this for my 4yr old when she moved up to her "big girl bed" she loves it! It made the transition so much easier. My granddaughter really likes it.